Many of the 1950s hairstyles were simple while others could be extravagant. Soft, curly styles were all the rage and the shorter the hair, the better. Glamorous hairstyles were popular as well. The fifties set the stage for some styles that are even seen and worn today. With the war just ending, the 1950s were a time of peace and prosperity. One of the most popular hairstyles of the 1950s was the ponytail. Still worn and loved by women and girls of all ages, the ponytail is a simple and classic style. There is nothing to a ponytail, all you need to do is to gather the hair behind your head and secure it into an elastic or ribbon. In the 1950s, it was quite popular to wrap a chiffon scarf around your ponytail for a casual, fun look. The poodle cut worn by red-headed star Lucille Ball. This short, super curly style was widely popular and often achieved by getting a perm. A bouffant style was an outrageous backcombed style where the hair is piled high on the head and some hair hangs down by the sides. This style was achieved by lots of teasing and backcombing. Beehive hairdos actually resemble a beehive. This updo style has a smooth, cone-like shape and could range from several inches to a foot or more in height. Today, Marge Simpson from the Simpson's cartoon wears this style as does singer Amy Winehouse. 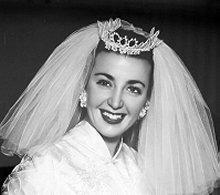 A French pleat or chignon is still a popular style seen on brides and for special occasions today. A French pleat is twisted in a fashion so as to form an intricate coiled hairstyle and is secured by using hair pins and a lot of hair spray. The chignon is a simple bun secured by pins. It can be sleek and smooth or messy and natural. Either way this classic hair updo is here to stay. Pin-curls were all the rage in the 1950s. These small ringlets were created by finger waving the hair and securing the waves in place by hairpins. The curls were sprayed to keep in place. Women wanted curly hair in the 50s and would sleep in curlers and rollers to achieve curls if they didn't want permanent curls. The ducktail or D.A. was a cool style for men in the 1950s. Men would comb back their hair and grease it into place. Think John Travolta and the T-Birds in Grease or Fonzi from Happy Days. Sideburns were also popular for men. James Dean and Elvis wore them and made them popular for men and loved by women. Straight hairstyles were no longer the rage in the 1950s and having curly or wavy hair was in demand. The 1950s were a time when visiting the beauty salon became popular and hair became a focus of fashion, and that trend continues even today.